Create unlimited delicious creations toasted to perfection. Spacious Four Slice Capacity: The Chefman 4 Slice Countertop Oven is a key accessory to any tightly spaced kitchen or dorm room. 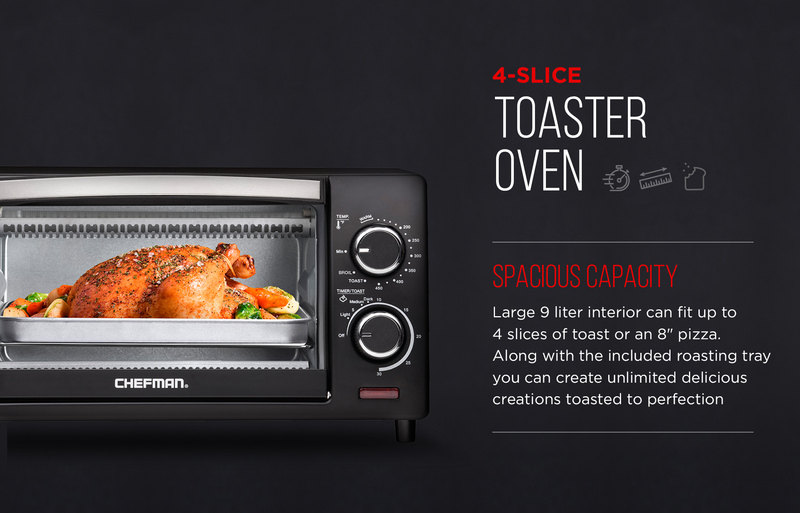 Large 9 liter interior can fit up to 4 slices of toast or an 8" pizza so you can create unlimited delicious creations toasted to perfection. Advanced Cooking Technology: Powerful 1000W oven has many cooking functions to bake, broil, toast, and keep warm, as well as a variable temperature range from 100-450 degrees to serve your baking and cooking needs. Convenient: Enjoy the convenience of countertop cooking with this toaster oven; 30 minute countdown timer features ready signal bell so you know when your food is ready, while large glass door gives you visibility of your food as it cooks. Easy Clean: Removable roasting tray and toasting rack are dishwasher safe for easy cleaning.